Early this summer, I decided to try my luck at growing a garden…again. Now, I’m definitely not known for my green thumb. Matter of fact, most plants that I have brought home in the past have quickly wound up brown and crunchy. It was funny – as I was strolling around the garden center of my local Home Depot, I kept imagining the plants shivering in fear as they screamed “Don’t pick me! Please, please don’t pick me!” I handed over my credit card to pay for my tomatoes, various herbs, and rose bushes and I got the feeling that I was flushing a nice chunk of change down the toilet. I asked the cashier to wish me luck as I pushed the cart out to my car. Well, things turned out quite differently this time around. My garden flourished! I was mostly amazed by my tomato plants that grew taller than me (I’m about 5’4”). I especially loved the heirloom tomatoes because of their odd shape and beautiful orangey-red color with hints of yellow and green. My basil and rosemary plants also took off and so I was able to get a few nice caprese salads out of the deal. Is it possible that I inherited my mom’s and grandma’s green thumb after all? After putting in all of this hard work, my husband and I ended up selling our house just a few weeks ago and so I’ve been forced to leave my little garden behind. And due to stress of buying a new house and then moving, I’ve not had much time for painting over the past month. 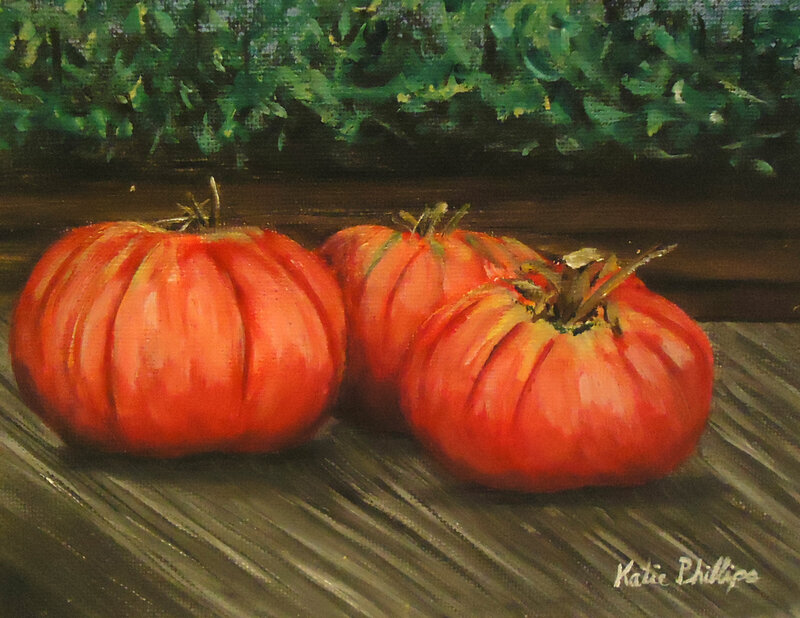 However, this week I was finally able to sit down and complete this quick painting of my heirloom tomatoes that I’ve been dying to do. I think this painting will serve as a proud little reminder of our old home and as proof that I can in fact actually grow something.